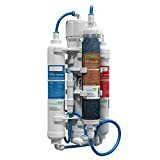 The Express Water RODI10D is a reverse osmosis, deionizing drinking water filtration system that is designed to produce clean, safe drinking water. Why Should I Consider Using an Express Water RODI10D Water Filtration System? The water flowing out of your taps may not be as safe to drink as you assume. Tap water that comes from municipal sources contains additives that can be harmful to people that have compromised immune systems or other chronic health issues. The Express Water RODI10D is perfect water problem solution to use in older homes. Older homes often have plumbing that uses lead pipes. The lead in theses pipes can leach into the water flowing through them, thus raising the risk of encountering long-term health problems. The Express Water RODI10D removes 99% of these impurities. How does the RODI10D Filter System Work? Pressurized, running water is passed through our specially designed membranes and physical filters for the purpose of removing inorganic solids from the water. The Express Water RODI10D is designed to remove salts, minerals, lead, and other particulates you can’t see with the naked eye. It provides healthy, pure drinking water. What are the Potential Health Benefits of Using the Express Water RODI10D Filtration System? The Express Water RODI10D filtration system removes toxic levels of Lead from drinking and cooking water. It also removes harmful levels of salt and dangerously high levels of chlorine from water. As an added benefit, the RODI10D removes microorganisms that are potentially harmful to those with suppressed immune systems, such as patients with cancer that are undergoing chemotherapy,or those with other chronic health conditions. The storage tank holds 3 US gallons of filtered water. It softens hard water and is perfect for water used in saltwater aquariums, both for fish and for coral reef aquariums. What are the 6 Stages of Filtration? The Express Water RODI10D removes large and small particles, as small as 5 microns in size. This includes rust, sand, and dirt. The Express Water RODI10D filters out the taste and smell of compounds like chlorine by using a filter constructed of activated carbon. It uses a block filter made of coconut carbon to remove volatile organic compounds(VOC’s) and harmful chemicals. 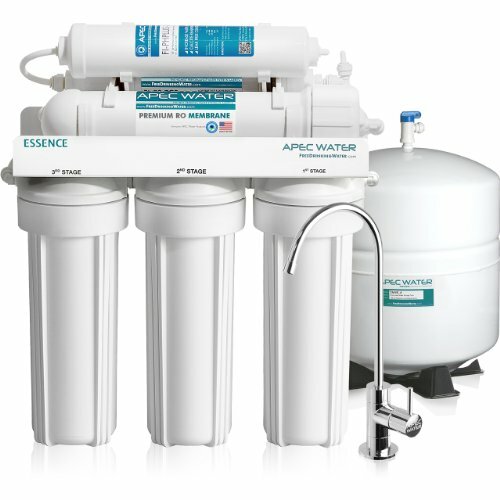 The Express Water RODI10D filtration system uses a thin reverse osmosis membrane to remove 99% of bacteria. It uses water polishing filters, made from a granulated form of carbon, to improve water’s taste and smell. The Express Water RODI10D incorporates deionization to remove the minerals commonly found in hard water, as in water that comes from wells. The deionization process also helps to improve the taste and smell of water. Some customers have reported that the hoses may leak if they are not firmly connected. When assembling the unit, listen for a clicking sound when attaching the hoses to the unit. Customers have also complained about the appearance of micro-bubbles in the water as it exits the faucet. These bubbles can make the water seem cloudy. The best solution to this is to let the water set for a minute or two, for the bubbles to subside. 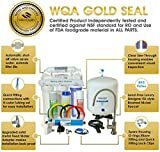 In conclusion, the Express Water RODI10D reverse osmosis and deionization water filtration system delivers fresh, clean, great-tasting water free of harmful impurities at a price designed not to break your budget. Knowing how water filteration works, and how it can help you, is important, be sure to check this epic guide here.